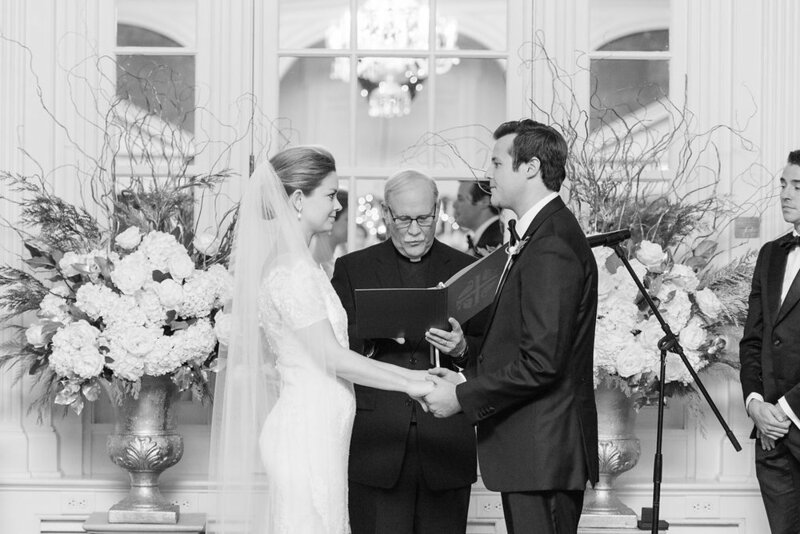 Happy First Anniversary Sophie and Luc! 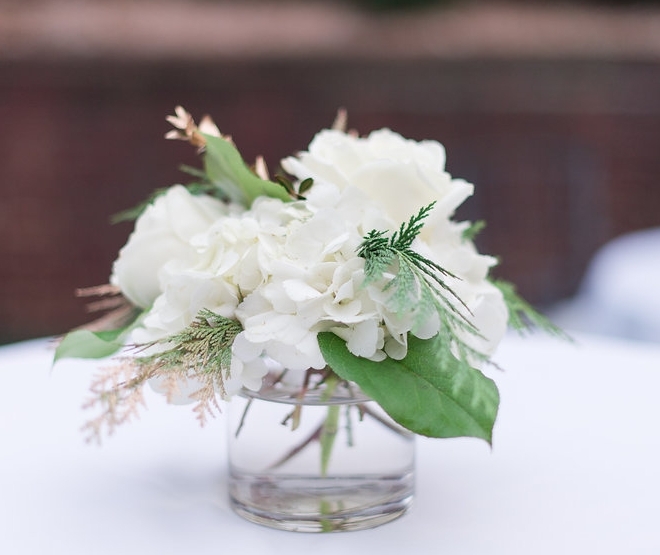 Classic Christmas Wedding at Georgetown’s City Tavern Club. Sophie Pyle Ziegler is a woman about town; she runs her own successful media company, Rose Media, and is always at every party you want to go to. I even caught her on a Real Housewives of Potomac episode. Initially, Sophie and I bonded over our love for reality television and pop culture. When I voted on her Instagram story that Karlie Clausen was more boring than Gigi Hadid, she lol’d and replied they were both boring. After she and Luc got engaged, she DM’d me to let me know she was looking for a florist and asked if I would have a chance to talk flowers with her. Of course I did. We had our initial consultation via phone and I loved her bubbly, exuberant personality. 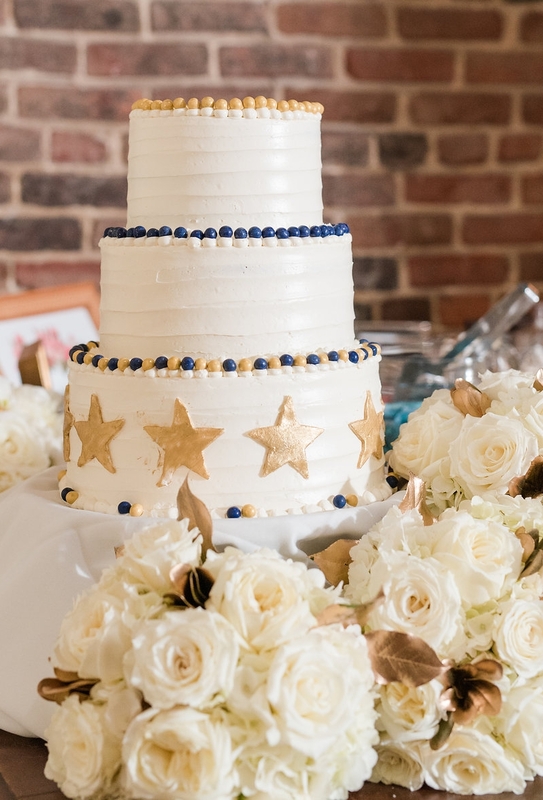 When she told me she wanted a very classic DC wedding, I told her that I had spent time freelancing in The White House Floral Shop, and that was about as classic as you could get. She loved the Obama’s and was thrilled to have a florist who had also designed for them. 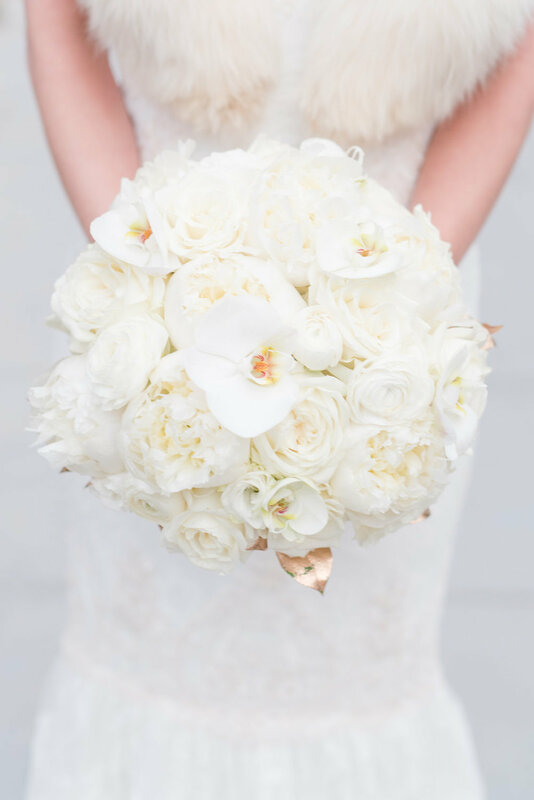 Sophie’s classic, round bouquet was made of snow white peonies, garden roses, ranunculus and phalaenopsis orchids. The edges were finished with touches of hand-guilded greenery. The next time Sophie and I met, it was for a walk through of her quintessential Georgetown venue - the City Tavern Club. It was the first time I had worked at the club since starting my company and it was the first time Emily Alyssa and I met. Since then both have become two of my favorites! 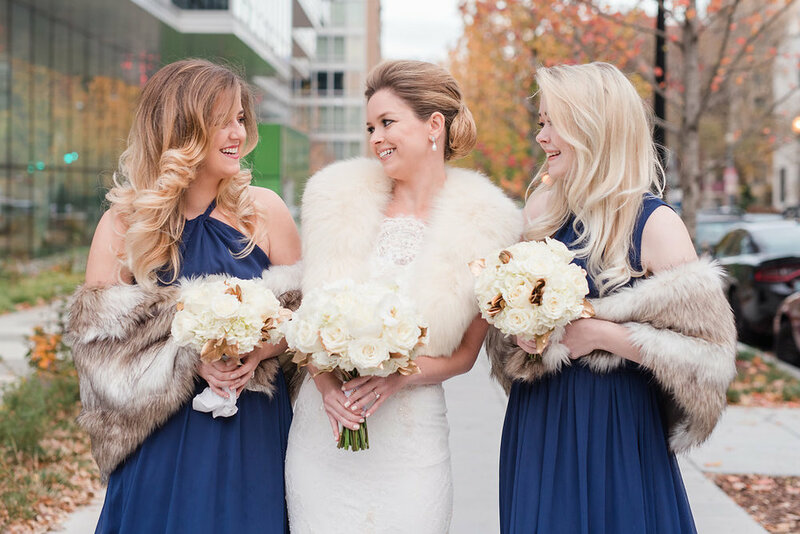 The morning of Sophie’s wedding, I delivered her bouquet to the hot salon, Karma by Erwin Gomez where I found her bridesmaids in great cheer, lounging and drinking bubbly. The salon is very chic, with discreet individual hair stations for each client (which must be appreciated by DC’s glitterati who just want to have their hair done in peace!) I presented the bouquet to Sophie and she couldn’t have been more gracious. Sophie walked down the aisle in a stunning Marchesa dress from The Bridal Room VA that was reminiscent of Pippa Middleton at the royal wedding. The holidays are fast approaching and I wanted to take a minute to shine a light on a cause near and dear to my heart. It’s called Light Up the Season and it benefits Children’s National Hospital. The event (formerly known as The Georgetown Jingle) raises money to support the Hospital and is held every year at The Four Seasons Hotel. 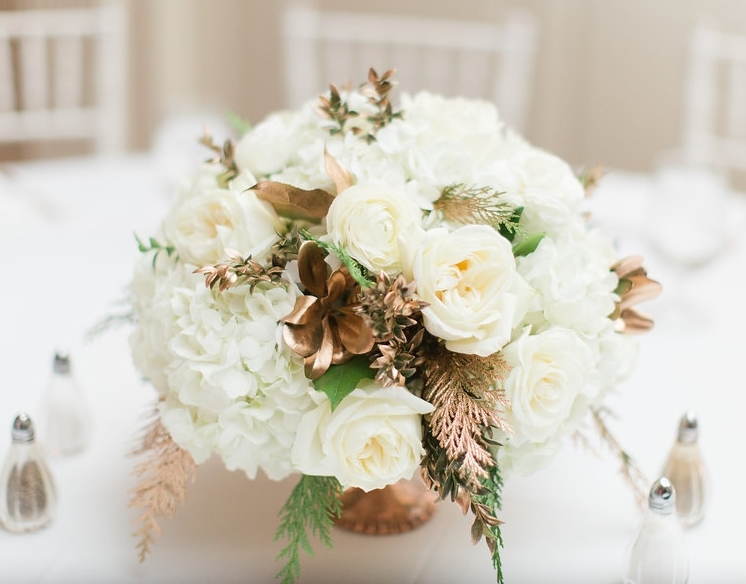 Each year, 12-15 of Washington’s top interior designers and florists are invited to decorate a tree or holiday item, like a wreath, menorah or mantle piece, that is then auctioned off at a fun family-friendly afternoon event (buy tickets here). Last summer, I was excited and honored to receive an email from the event’s organizers asking me to participate for the second year in a row. The process works like this: Every designer is partnered with a Children’s National Hospital patient and together the patient “artist” and designer work to come up with a fantasy holiday theme. This summer, I had the pleasure of meeting a sweet young lady named Annabelle. 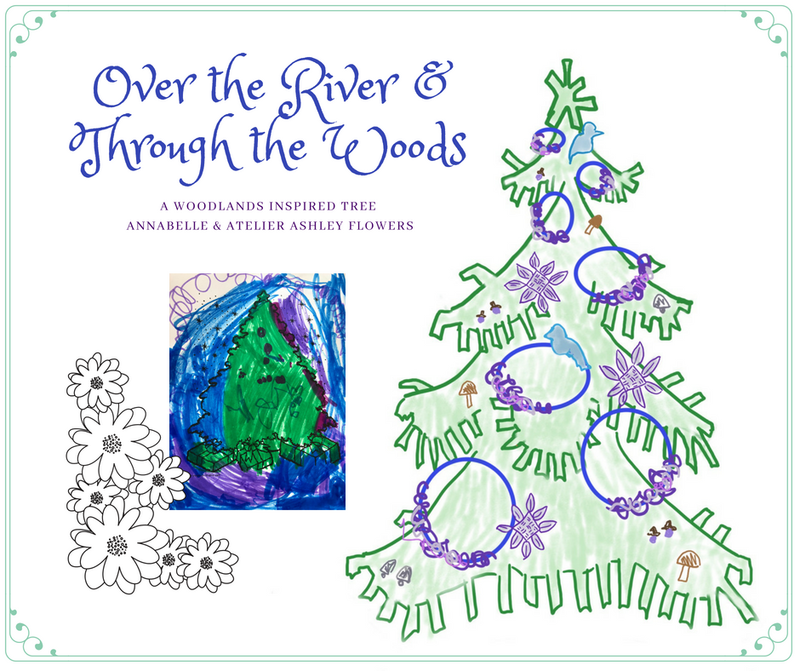 As I talked to Annabelle about what she would like to see on her tree, she drew the small picture below. Her favorite color is blue, her sister’s favorite color is lavender, and, of course, mine is purple. Naturally, we were already in harmony! The next step was to begin the work of decorating a tree. In recent years, I have found myself missing the camaraderie and aesthetic kismet that comes from working with a large group of volunteer designers. 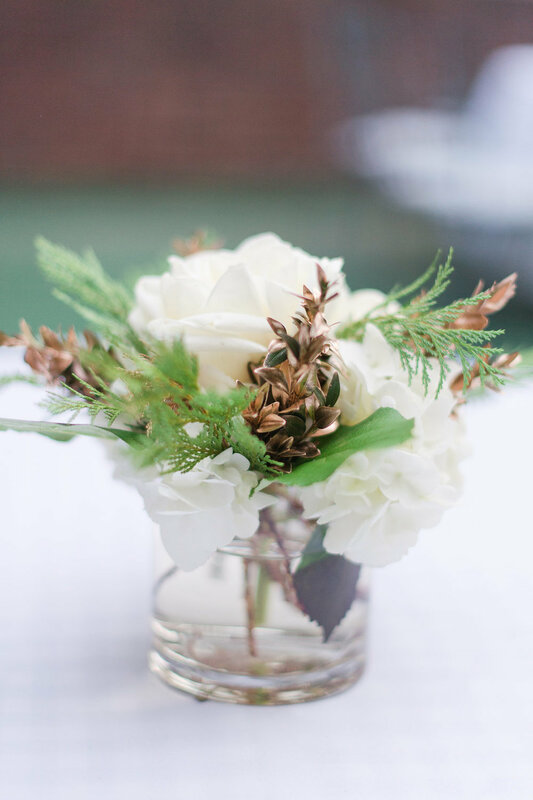 Heavily influenced by my time in the White House Floral Shop under Former Chief Florist Laura Dowling, I wanted to recreate this experience and feeling. So I reached out to all my creative friends and asked them to help me #craftforacause. The response was incredible; I am so warmed by the generous people in my creative community! I hosted the first #craftforacause party at my home in mid September. As the saying goes, “many hands make light work” and the attendees produced dozens of floral hoop wreaths made out of yarn and felt. Thanks to Anne Kelley, Carleigh Smith, Emily Alyssa, Jasmine Ellesse, Maria Kessel and Vicky Choy for kicking off #craftforacause! 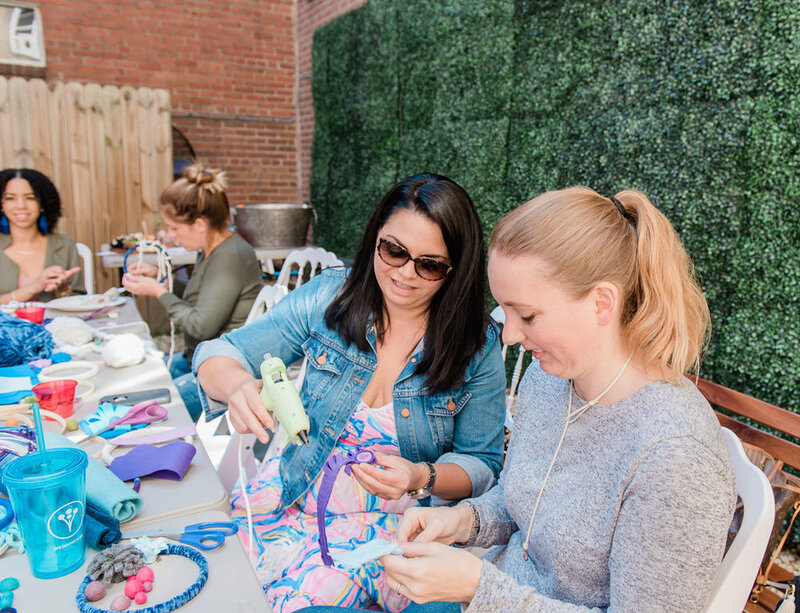 The second #craftforacause party was held on a beautiful late September day at Periwinkle, a lovely clothing boutique in Old Town, Alexandria. Marie Windsor Photography joined us and took lots of detailed photos. Pamela Vetrini of Cheats and Meeses brought us a delicious cheese board extravaganza to fuel our designs. 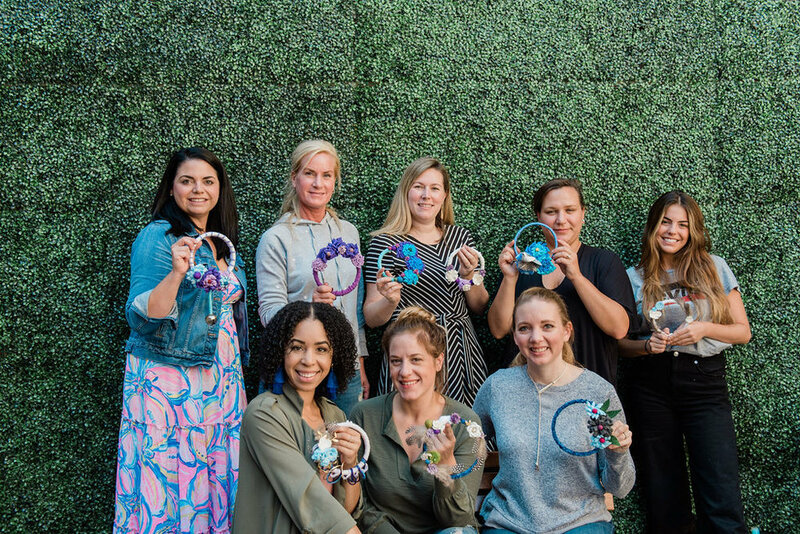 The designers for our second party included Elizabeth from Periwinkle, Kelley Cannon, Janice Carnevale, Lindsay Kidwell, Jasmine Ellesse and Nicole Nespor. It was fun to see how unique everyone’s designs were and how different they were from the first party. 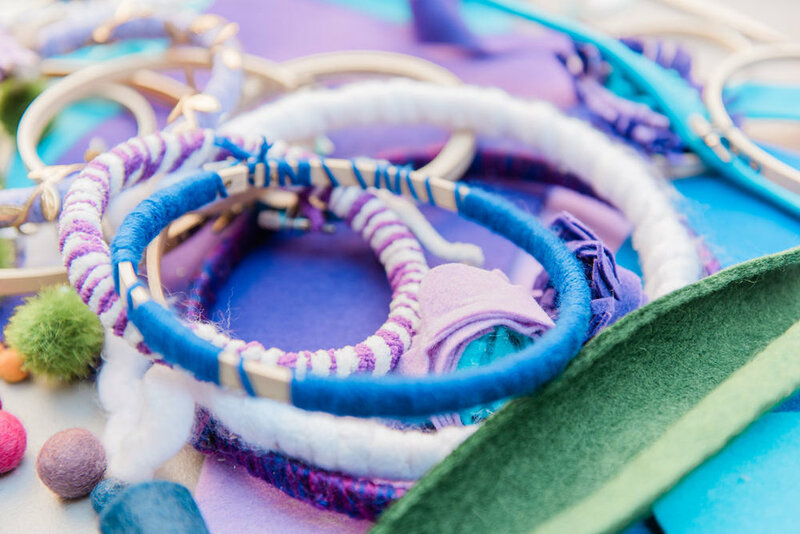 There was one more #craftforacause party this weekend and I can’t wait to show you those designs too! The finishing touch on my tree comes from Accent Decor who generously donated dozens of beautiful glass and felt ornaments. These handcrafted ornaments are just what I needed to complete the tree’s wintery woodlands theme. While it is not guaranteed that Annabelle can attend the event, I sure hope she can because I think she will love what we have created. Thank you to everyone who came out to #craftforacause. And thanks in advance to those will help set-up and decorate the tree in preparation for the big event on December 16. I’ll make sure to share pictures of the finished product once it is complete! Do you remember in class when the teacher said "there is no such thing as a stupid question" and "if you are wondering that then chances are so are your classmates?" Well, the same applies when it comes to wedding flowers. I have so many brides emailing and calling wondering what the next steps are, apologizing for their lack of knowledge and feeling completely overwhelmed.